1. A secondary infection originating from a focus of infection already present in the body. 2. Spread of a disease from one part of the body to another part. 3. Inoculation with organisms already present in or on the body; self-inoculation. 4. Injection of an autovaccine. Autoinoculation is a procedure in which cells are removed from a person's body, treated or medically changed, and then placed back into the body. This procedure is done to help prevent an immune reaction. Autoinoculation can also refer to the movement of microorganisms from one location of the body to another. 1. A disorder resulting from absorption of the waste products of metabolism, decomposed matter from the intestine, or the products of dead and infected tissue as in gangrene. 2. Poisoning with toxic substances formed within the body, as during intestinal digestion. 3. Poisoning by metabolic products elaborated within the body; generally, toxemia of pathologic states. 1. A system in which a workplace or process has been converted to one that replaces or minimizes human labor with mechanical or electronic equipment. 2. A mechanical device, operated electronically, and which functions automatically, without continuous input from an operator. 3. The act of automating something, or the state of being automated. 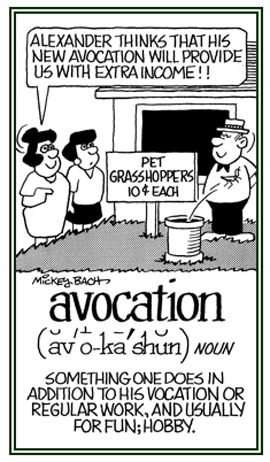 This word was coined in 1936 by D.S. Harder, a Generl Motors employee, but it didn't come into popular use until around the 1950s. Harder defined automation as the "automatic handling of parts between progressive production processes," but one of the current definitions is "the technique or system of operating a mechanical or productive device by highly automatic means, as by electronic devices"; as well as, those shown above. 1. The production and operation of airplanes and other machines that fly: The three women, whose life stories were told in the film about early aviation, lived in a city near where Jane grew up. 2. 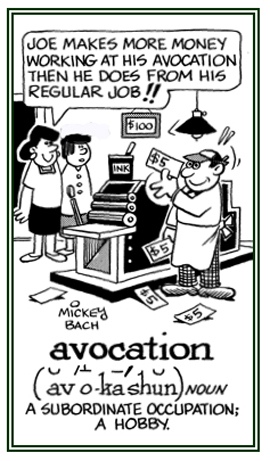 Etymology: from Latin avis, "bird" + -ationem, "an action, a process." Aerial navigation or the handling and guidance of aircraft in the air: Tim's son was training to be a pilot in the profession of avigation. 1. A hobby or pastime; not one's normal work: Lynn’s avocation, after teaching in the morning, was working in her garden because she loved the fresh air, seeing the plants grow and enjoying it! 2. The opposite of one's career or occupation: Susan knitted scarves, caps and sweaters as an avocation, which was quite different to her job as a financial advisor, and she gave them to her friends as Christmas presents! 3. 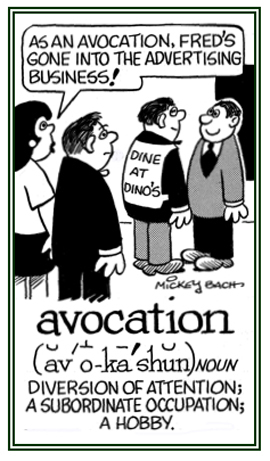 Etymology: "a calling away from one's occupation", from Latin avocationem, "a calling away"; and Latin avocare, "to call away"; from ad-, "away" plus vocare, "to call". © ALL rights are reserved. Any act that makes people primitive and uncivilized. The breakdown of materials by microbial action: Biodeterioration is a situation where organic compounds can be decomposed by bacteria and other micro-organisms; such as, the constituents of sewage. The conversion of organic matter into biogas. The deliberate alteration of the species of an ecosystem by adding or removing certain ones: Sometimes predators are involved in a biomanipulation in order to balance the composition of an area. Organisms use a wide variety of minerals to make their skeletons, including silica, apatite, and several polymorphs of carbonate, in particular aragonite and calcite. It is unclear, however, why different taxa evolved to use one mineral rather than another. Lineages rarely switched their mineralogy after acquiring skeletons, suggesting that, for most taxa, ambient seawater chemistry does not strongly influence skeletal mineralogy. Mineralization of most animal skeletons is biologically controlled, occurring in an environment isolated from seawater. As a result, seawater chemistry does not have a direct influence on the mineralogy of most animal skeletons the way it does for biomineralizers that induce mineralization directly from seawater. —Excerpts from "Seawater Chemistry and Early Carbonate Biomineralization"
by Susannah M. Porter, Science, June 1, 2007; page 1302. Showing page 12 out of 96 pages of 1437 main-word entries or main-word-entry groups.